The PetSafe Stubborn Dog In-Ground Fence is designed with guardian breeds in mind. Four higher intensity correction levels safely but effectively get the attention of dogs that have been bred for their persistence and high pain tolerance. The correction levels on the stubborn dog fence collar are 3 times that of a normal fence. Most dogs respond well to the normal correction levels given proper training and higher intensity correction actually undermines training by confusing and overwhelming the dog. We only recommend this system for very large dogs or dogs who historically have a low stimulation sensititivity that translates to difficulty in training. The Stubborn Fence lacks a rechargeable collar but uses common 9-volt battery. The system is compatible with other PetSafe receiver collars so you can use a less intense option for dogs that don’t need the increased correction. Strongest Available Correction: The PetSafe Stubborn Dog collar offers 50% stronger corrections than standard collars because it is specifically designed for guardian breeds with high pain tolerance or dogs over 100 lbs. This increased correction is too much for smaller or more sensitive dogs and must be used with care to avoid over-correction. 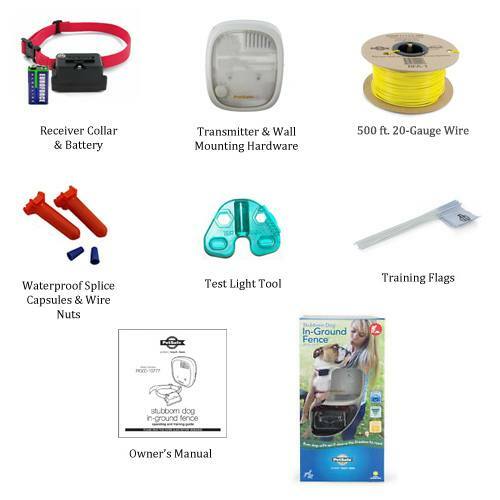 Compatible With PetSafe Indoor Zones: The Stubborn Dog collar included in this kit is compatible with the PetSafe Indoor Radio Fence (PIRF-100), which allows you to create dog-free areas inside your home using the same boundary system and collar as your Stubborn Dog Fence. These exclusion zones are most frequently used to restrict your pet's access to certain areas of the house or keep them off of furniture. 5 Individually Adjustable Correction Levels: The Stubborn Dog collars allow you to set the correction level for each collar on the system independently. This makes the system suitable for multidog households where each dog has different correction strength needs. Even the lowest correction levels on the Stubborn Dog collar are quite strong and not recommended for smaller dogs or any dog with higher sensitivity to stimulation. Over-correction can overwhelm the dog and undermine the training process. Disposable Battery: This collar uses a standard 9-volt battery. Although most people generally prefer a rechargeable battery, a generic 9V is easy to get your hands. This battery has a lifespan of 3-4 months. Large, Bulky Collar: The Stubborn Dog collar is about the largest collar on the market, and one of the heaviest too. 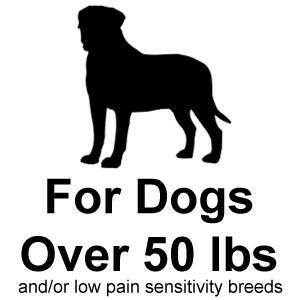 Even without the stronger correction levels, it still wouldn't be suitable for dogs under 20 lbs. Compatible With Other Collars: The PetSafe Stubborn Dog Transmitter is compatible with other PetSafe Dog Fence Receiver Collars, so this is a suitable system for a multidog household where only one dog needs the Stubborn Dog collar. The PetSafe Elite Little Dog and PetSafe Deluxe UltraLight receiver collars are also fully compatible with the Stubborn Dog system. 10 Acre Capacity: The PetSafe Stubborn Dog fence includes the PetSafe Basic Transmitter, the same one that is included in the PetSafe Basic System (PIG00-13661). The transmitter can handle up to 10 acres. Adjustable Boundary Width: The reliable and simple transmitter allows you to adjust the width of the boundary zone between 0 and 10 ft. The larger the boundary zone, the less likely your dog is to cross it and break out. While most dogs are fine with a boundary zone of 3-5 ft., it's nice to have the option to increase it during training or for those dogs that are particularly driven to escape. Boundary Alarm: The boundary alarm sounds when you have a wire break anywhere in your fence. A steady green light confirms that the boundary is operational. Lacks Battery Backup: Although this basic transmitter is easy to use and reliable, it does not include battery backup. This is generally not an issue for most dog fence users but for those who live in areas with frequent power outages you may want to look into an aftermarket battery backup device. This dog fence is awesome. The PetSafe stubborn dog fence system is great. I have researched a fence for my three dogs for over a month. I took my time and searched for a dog fence that will meet all of my needs. I decided to go with FlexPetz and purchased the PetSafe stubborn dog fence. This dog fence is a great investment. It has surpassed my expectations of a dog fence system. What I truly value is the helpful and knowledgeable staff that suggested to go with this dog fence. It is a perfect match. I now realize that a dog fence needs to be effective to keep dogs secure in my yard. With FlexPetz's help I got it right the first time. I recommend this dog fence to people who are looking for a great dog fence for their dogs. Just finished the installation of my new system. FLEXPETZ tech support made this possible. They helped me find the right system for my breed. They discussed installation and training of my pet. I am not very handy but was motivated by a saving of $1500 from a professional installation. There are several videos available to help with understanding the process of installation and training. Thanks Flexpetz. I have an extremely stubborn labradoodle. He needed much more exercise than the daily walks we were giving him. My HOA doesn't allow traditional fences in our neighborhood. After much debate, I decided to give the dog fence a try. Installation took some time, but wasn't impossible. I did take the technician's advice and upgrade to the stronger wire. It is heavy duty and looks like it will last a long time. The cost was worth it to me. I never thought this fence would work. My dog will not leave the fence. I even threw a hamburger patty over the wire to see if my dog would break through, and he stayed put. You have never met a dog like my Snoop. A 95 pound pit as stubborn (and loving) as could be. When he was a puppy, crate training was a disaster as he would throw himself back and forth in a crate until eventually it would collapse or crack or whatever so that he could get out. As you can imagine all types of containments systems have been a fail until now! Snoop can now safely enjoy the outdoors like he never could before. We are finally leash free and he is loving it! Worth every penny! I have huge Pit Bull named Helix. When I say huge I mean as big as I have ever seen when it comes to this breed. He is very hard to control and has been successful in completely demolishing every other physical wire fence that I purchased. I did also try an in-ground fence but Helix ran through it as if it never worked. I called the customer service line and they said they would send an installation tech to check it out because I surely set it up wrong. The next day the tech arrived looked at the system and said with a confused look on his face, it looks like everything has been correctly installed. I told him I know because I did it myself. Well after a long process of re-installation and collar exchanges I decided to throw in the towel and get my money back. Just another Fail and I was getting tired of looking. I decided to take my efforts online for one last attempt at this. I thought I should just give in and shell out the money for a wooden fence. As I searched the net I came across FlexPetz.com several times so I took a peak inside and came across the Stubborn Dog Fence. From the moment I saw it I was hooked, the overview and reviews were helpful but I wanted to see for myself so I tried it. It actually worked for Helix. The correction levels on the collar made this in-ground fence a God send and the price was golden. I found a solution and Helix began to obey the boundaries. The quality for price is much greater than anything else out there. Flex petz.com is the best in dog fencing and I will never buy another. I want to say that I have never gotten this kind of service from any other dog fencing provider and the quality has far exceed the rest. I am pleased with the price and my only issue with the system was the initial set up of the fence. Other than that everything works great and allow me to live life more effectively.A big THANK YOU to Flexpetz.com.